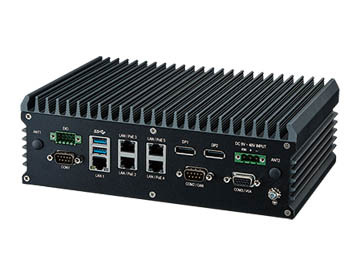 SINTRONES, a world-leading provider of In-Vehicle products and solutions, launches the new cost-effective VBOX-3210 series powered by AMD Radeon™ graphics via the third-generation Graphics Core Next (GCN) architecture enables the AMD Embedded R-Series SOC Quad Core RX-421BD/RX-216GD and GX-224IJ/GX-215JJ. The new series are developed for new generation of various vehicle applications. The VBOX-3210 series is an astonishing graphics with true 4K decode/encode, intelligent power management, full functional extensible and extremely compact size in-vehicle computing. The Superior 3D graphics from triple independent Display (2 x DP port, 1 x VGA) is driving immersive for eye-catching 4K multi-media, and the max. up to 32GB DDR4 DRAM enhance the performing of the 3D graphics. It has 5 x GbE LAN and can be integrated max. 4 x PoE 802.3at which is a suitable solution for portable, fixed and in Vehicle video surveillance applications. Its strong flexibility has 3 x miniPCIe + 1 x M.2 2230 A-E key slots for extended modules of wireless, LTE w/ Dual SIM Card, WLAN, GPS Dead Reckoning, GSM/GPRS, BT. One CFast and one SATA storage is a perfect solution for mobile DVR, driver behavior recording and in Vehicle digital signage The Built-in Battery option provides internal battery kit for 10-15 minutes operating (Taiwan Patent No. : M447854). A very wide input voltage ranges from 9 to 48V with Smarter Vehicle Power Ignition can be used for all kind of vehicles including Battery Electric Vehicle. It can be operated in extreme weather conditions (Operating temperature: -40 ~ 70℃) suitable for (LPR) License Plate Recognition and outdoor traffic surveillance. In addition, the new VBOX-3210 series is longevity and supports at least year 2025 as stability and reliable solution. Using the SINTRONES VBOX-3210 the customers will be able to implement and manage/fleet management in-vehicle solution in consumer field such as buses, trains, taxi, school buses, trucks, forklift, agriculture machine or public sectors such as police cars, fire trucks, garbage truck, or snow plow. For more product information or pricing, please visit our global website at http://www.sintrones.com or contact one of our sales representatives at sales@sintrones.com. For more information, please visit Sintrones website, products / In-Vehicle computer.